Are you “slim,” “medium,” or “stout?” The conductor will decide. 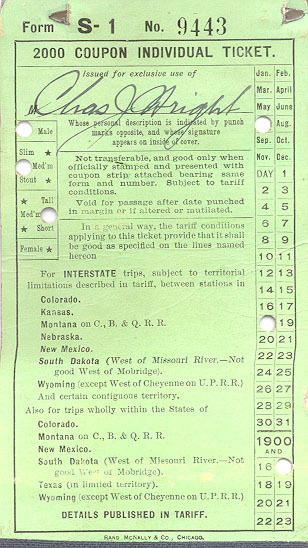 This 1917 train ticket from our Denver & Rio Grande Railway file has a hole-punch area for a physical description of the passenger. The conductor would mark whether the passenger was male or female; tall, medium, or short; and slim, medium, or stout. The purpose of this, presumably, was to cut down on ticket-stealing and ticket-transferring, not to humiliate the passenger. One hopes. This entry was posted in new attention on old item on September 15, 2011 by jessyrandall. Did they play baseball or softball? We’re not sure. 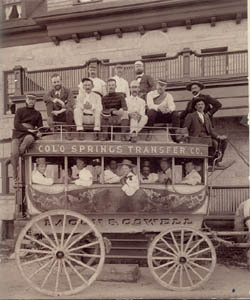 Marshall Sprague’s Newport in the Rockies identifies almost all the players and the “fair [female] rooting section,” starting at the top, from left to right: Professor Lewis Ahlers (German), right field; Dean Edward S. Parsons (English), pitcher; Reverend Philip Washburn, first base; Professor Florian Cajori (Physics), left field; Professor Arthur Stearns (Elocution), catcher; Professor Francis W. Cragin (Geology), second base; Librarian Manly Ormes, center field; Telegraph Editor Charles Sprague, third base; President Slocum, shortstop. The women in the coach are (left to right) Nina Lunt, Mabel Stearns (behind bar), Faith Gregg, Regina Lunt, Sarah Jackson (Mrs. P.A. Loomis), Mary Noble (CC class of 1896), Foster (Flossie?) Dickerman, Mary Slocum at far right. In August of 2011, we purchased a 1536 edition of Dante’s Divine Comedy for use alongside our 1491 edition, a donation from Jane Carruthers Hale in memory of her father John A. Carruthers. A great many versions of the Comedy were published in the early years of printing, perhaps as many as 40 editions between 1472 and 1550. 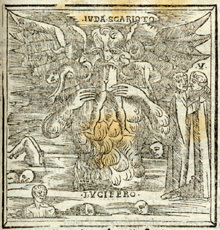 Both of our editions have woodcut illustrations: at right you can see two renderings of Lucifer devouring Brutus, Cassius, and Judas Iscariot. 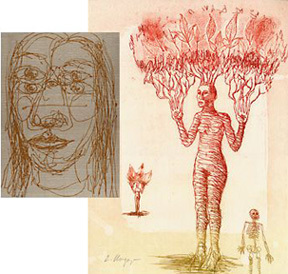 The image on the left is from the verso of leaf 142 of the 1491 edition; the image on the right is from the verso of leaf 189 of the 1536 edition. 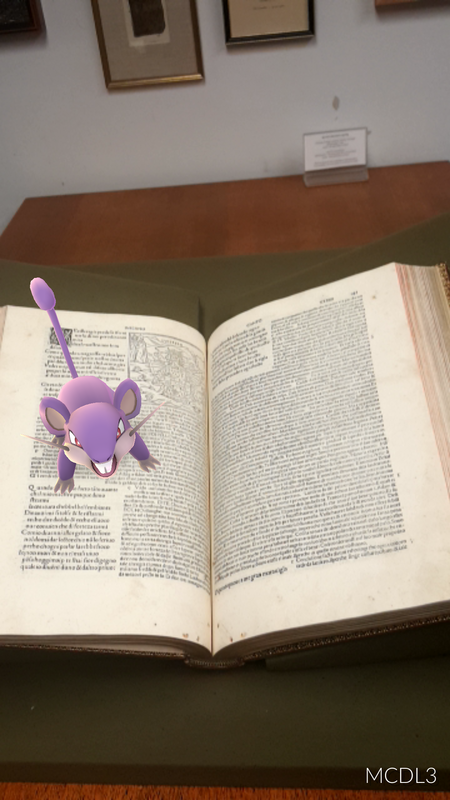 Yes, the 1536 edition has some discolorations. How do you think we could afford it? We don’t mind. This entry was posted in new acquisitions on September 15, 2011 by jessyrandall. Artist Mary Chenoweth taught at Colorado College from 1953 to 1983. She was adept in many art forms, including collage, painting, woodcarving, printmaking, and more. Special Collections purchased her one-of-a-kind The Turn Book in July of 2011. It is long and thin (5 x 46 cm) with slipcover, canvas binding, and 18 paper or canvas leaves, all hand-painted. Special Collections has one other Chenoweth book, Malaysia (copy 1 of 7) and a collection of Chenoweth papers. 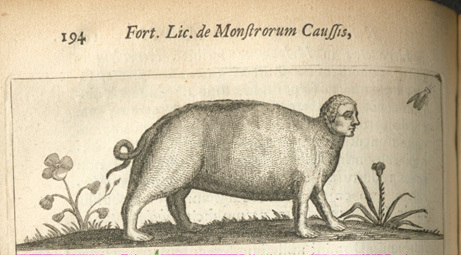 In late 2010, Special Collections purchased a 1665 edition of Fortunio Liceti’s De Monstris, an important work on human and animal abnormalities. Unlike his predecessors, Italian scientist Liceti (1577–1657) believed that physical anomalies occurred naturally, not as divine punishment for sin. 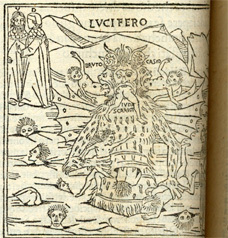 This edition, printed in Amsterdam by Andrea Frisii, contains many engravings depicting both the possible (conjoined twins) and the impossible (human-animal hybrids such as the one in the image above). More of Liceti’s images are available at Yeeeeee. In August of 2010, Carky and Mary Rubens (CC classes of 1952 and 1953, respectively) donated a bifolium (in other words, two leaves, four pages front and back) from a 1743 manuscript Qur’an. 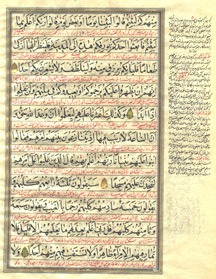 Each leaf is in Arabic (black ink) and Persian (red ink) with gold decorations and notes on the text in the margins. Peter Wright (CC Religion faculty) tells us that the image with this post shows part of Surat-al-Kahf (Chapter 18) or the Story of the People of the Cave. We look forward to showing the leaves to students in the 2010-2011 school year, along with other manuscript and printed leaves from our collections, listed here and including, of course, a leaf from the Gutenberg Bible donated by the Rubens family in 2005. For several years, Philadelphia Rare Books and Manuscripts has been looking for an affordable codex for CC. In May of 2010 they found a late-15th century Breviary on vellum for us. We couldn’t be more pleased with the purchase. 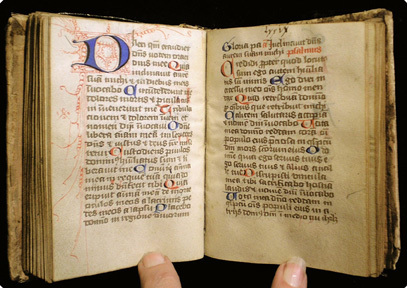 This Breviary, a collection of abbreviated prayers in Latin, was done in France circa 1490. 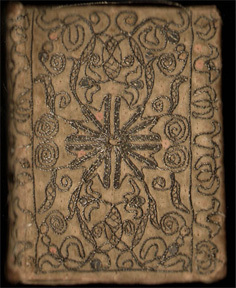 It is in a 17th century binding of white silk and silver thread. Its first page has an illuminated initial B (not shown). It is quite small, just 11 cm tall. Its text is incomplete: it lacks at least 12 leaves and possibly as many as 20 or more. We expect the Breviary to be useful to anyone interested in medieval history, the book as object, or CC’s new thematic minor in The Book. In early 2010, the library purchased a copy of Robert Pinsky’s Ephemera: Poems with prints by Karen Kunc (Avoca, Nebraska: Blue Heron Press, 2009). Our copy is number 4 of 50 copies signed by the artist. Kunc’s work was concurrently on display at CC as part of the Sugar, Sugar exhibition in the IDEA Space at the Cornerstone Arts Center, and within days of its acquisition several students visited Special Collections to view the book. In support of Colorado College’s new minor in The Book (the past, present, and future of the written word in its material form), we are slowly building our collections of artists’ books and examples of different sorts of book structures; for more information on the minor, visit this page. 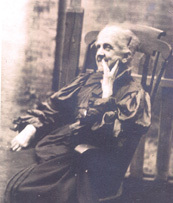 In early 2009, Special Collections acquired an album of photographs of Ann Scholfield Banfield, sister of Helen Hunt Jackson. Colorado College has the single largest collection of papers of HHJ, 19th century writer and activist for the rights of American Indians. This album, dated 1913, includes photographs of HHJ’s northeastern relatives, including Banfield’s grandchildren, born to HHJ’s widow William S. Jackson and his second wife, HHJ’s niece (and ASB’s daughter) Helen Banfield Jackson. The Jackson family had close ties with CC from its beginning: William S. Jackson donated money to establish the first dormitory on campus, and five of his children attended Colorado College. The album contains never-before-available photographs of those children, including several photographs of a college-age Edith Banfield Jackson, who later trained with Freud and became a noted pediatrician and psychoanalyst. Special Collections purchased this album with funds from the Archer Butler Hulbert fund. In April of 2008, Special Collections received three books published by the Yolla Bolly Press: Andre Gide’s Theseus (translated by John Russell, drawings by Sidney Goodman, 85 copies printed); Robinson Jeffers’s Roan Stallion (woodcuts by Karin Wikstrom, 135 copies printed) and Samuel Beckett’s translation of Bread of Days: Eleven Mexican Poets (notes on the poets by Octavio Paz, commentary by Paz and Eliot Weinberger, etchings by Enrique Chagoya, 141 copies printed, sample illustrations with this post). The donor, a CC graduate, wishes to remain anonymous. The Yolla Bolly Press, a letterpress in Covelo, California, has been in business since 1974. 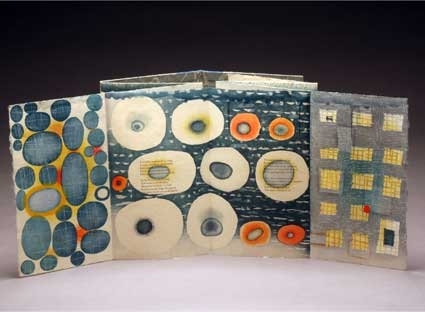 Their books are sumptuous and beautifully made. We invite you to visit Special Collections and see these books and other fine press and limited edition artists’ books in person.